Everyone realizes Metro bus operators have the daunting task of safely getting bus patrons where they need to go while battling our region’s often congested streets. The job is tough enough and it goes without saying our operators don’t need the additional worry of being assaulted while trying to do their job. There were 121 operator assaults in 2016 — a decrease of 29 percent over 2105. Of the 121 total operator assaults, 32 percent of the total assaults have had a suspect taken into custody. The majority of bus operator assaults involve fares or a missed stop. There were 323,059,463 bus boardings in 2016, meaning there was one bus operator assault per 2.6 million boardings. 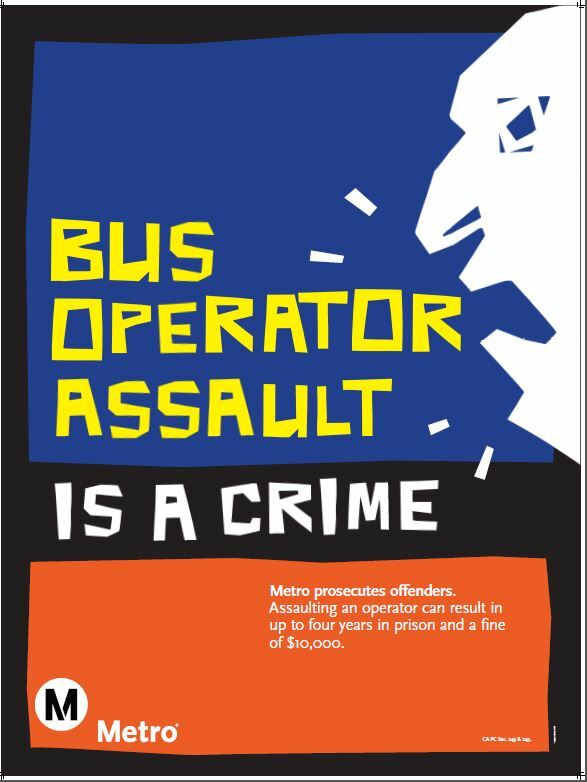 That’s 121 too many — and that’s why Metro has launched a new operator assault awareness campaign. Campaign ads remind customers of the legal repercussions from criminal behaviors against operators. A serious operator assault can warrant a $10,000 fine. Taboo behaviors Metro sees taken against operators include spitting, punching, kicking and verbal abuse. Metro has placed the new ads on posts and cards throughout the system — i.e. on buses, bus benches and shelters, among other locations. The agency has also run ads in local newspapers. The campaign augments other key Metro initiatives to combat operator assault. Metro has installed bus operator barriers on many of its buses. The agency has also installed inward facing cameras on buses to allow patrons contemplating a crime to know they are being watched. Video footage can be used for crime investigations and prosecutions. Operators themselves have also received training on conflict de-escalation. The agency has also pursued legislation to get higher penalties for those who commit assaults against operators. In addition to these efforts, last month Metro launched an operator appreciation campaign to show customers that drivers are real people too. It recognizes many of the agency’s best bus and rail operators, many of whom have excellent driving records and decades of experience in customer service under their belts. So, please be kind to our front-line transit operators. They get you where you need to go and they truly deserve your respect at all times. Typo: “a decrease of 29 percent over 2105” , I’m guessing 2015. As I’ve mentioned before, get LASD out of the donut shops and onto our transit vehicles if you want more reduction in crime.